Lok Sabha Elections 2019 LIVE: Earlier, Congress president Rahul Gandhi Wednesday said that nearly 1 crore youths lost their jobs in 2018 alone under the Modi government and appealed people to fight an ideological battle against the BJP in the upcoming Lok Sabha polls. Lok Sabha Elections 2019: Upping their attack on Prime Minister Narendra Modi before the general elections, the Congress Wednesday accused Modi of snoozing when fugitive diamantaire escaped from the country. The reaction came on the heels of the arrest of Nirav Modi in London. In a tweet, Congress spokesperson Randeep Surjewala said Nirav Modi, who he referred to as “Chhota Modi”, was arrested after the Opposition party questioned “Bada Modi”, a term he has been using to target the PM. Meanwhile, RJD leader Tejashwi Yadav said on Wednesday that the ‘Mahagathbandhan’ or Grand Alliance in Bihar is intact and its candidates for all the 40 Lok Sabha seats in the state will be announced after Holi, PTI reported. A delegation of Delhi BJP Wednesday met Chief Election Commissioner Sunil Arora and demanded "strong deterrent action" against the Aam Aadmi Party for violating the model code of conduct by allegedly playing the religious card to disturb communal harmony, PTI reported. The delegation comprising the Leader of Opposition in the Delhi Legislative Assembly Vijender Gupta, party MP from South Delhi Ramesh Bidhuri and other leaders including Subhash Arya, Subhash Sachdeva and Rajiv Babbar submitted a memorandum against the "misinformation campaign" by the AAP through its call centres. "We submitted a memorandum against efforts of the AAP to disturb communal harmony, peace and goodwill by playing the religious card. More than a dozen complaints and three CDs against call centres were also submitted. "We demanded a strong deterrent action against AAP Convener Arvind Kejriwal and other leaders," Gupta said. The Jammu and Kashmir BJP Wednesday alleged that the Congress had conceded to the National Conference's (NC) pro-separatist agenda after the two parties announced a pre-poll alliance in the state, PTI reported. The Congress and the NC finalised arrangements for the six Lok Sabha seats of the state earlier in the day. "The NC-Congress alliance is an eye-wash and a wake up call for Jammu," BJP spokesperson Brig (retd) Anil Gupta told reporters. "The Congress has not only surrendered to the National Conference but also conceded to the pro-separatist, Kashmir-centric, communal and divisive agenda of that party," he said. The Bharatiya Janata Party will field its candidates in all 28 Lok Sabha constituencies in Karnataka, senior BJP leader and MLA K S Eshwarappa said Wednesday, PTI reported. The former deputy chief minister also said the list of candidates has been almost finalised and could be released Wednesday night. Jana Sena chief Pawan Kalyan's elder brother Konidela Nagendra Babu joined the party Wednesday and was named the candidate for the Narsapuram Lok Sabha constituency in Andhra Pradesh. Admitting his brother, Kalyan described his brother as his "political guru", saying he had a clear understanding of politics. Nagendra Babu, popularly known as Nagababu, is the younger brother of Telugu film star and former Union Minister K Chiranjeevi while Kalyan is the youngest. The ruling BJD in Odisha Wednesday ridiculed opposition BJP for its delay in announcing the candidates list for the Lok Sabha and assembly elections in the state, PTI reported. Though BJD and Congress have already released the candidates' list for the first and second phase of polling on April 11 and April 18, the BJP is yet to announce to announce its nomination for even a single seat. "Are they(BJP) looking for dissidents from other parties ?" BJD spokesman Sasmit Patra asked adding the last date for filing of nomination papers for the first and second phase of polls is scheduled for March 25 and 26 respectively. DMK president M K Stalin Wednesday invoked the legacy of his late father M Karunanidhi to assure people that poll promises will be fulfilled unlike Prime Minister Narendra Modi who did not raise farmers' income, PTI reported. Hitting the campaign trail here in the Cauvery delta heartland after announcing his party candidates on March 17, Stalin announced crop loan waiver for all sections of farmers and not only small and marginal sections. "I have come here only after asking the party manifesto panel to release an amendment incorporating loan waiver for all sections of farmers," Stalin said. Prime Minister Narendra Modi: "Maximum languages across the world have understood the word 'Chowkidaar', it seems as if they all have accepted it in their vocabulary." PM Modi: "Today the whole country is taking the oath of being a chowkidar... they are saying main bhi chowkidar." Prime Minister Narendra Modi is interacting with over 25 lakh Chowkidars via audio bridge. In a media advisory, the Aam Aadmi Party has urged the journalists to not attribute quotes to anonymous sources from the party. AAP "media advisory": Journalists urged not to attribute quotes to anonymous sources from the party. Rahul Gandhi in Tripura: "Supreme Court judges come out to press and say they are not allowed to work. They are not being allowed to investigate the death of Judge Loya. Amit Shah, who wants Citizenship Bill, has a murder charge against him." Addressing a rally at Khumulwng, 25 km from Agartala, Congress president Rahul Gandhi said, "Minimum wage line will be decided and the Indian government will put money into the bank accounts of each poor in India." In an apparent hint to target the post of prime minister, BSP supremo Mayawati Wednesday asked her followers to not lose heart on her announcement to not contest Lok Sabha elections as there is provision at the Centre where a person has to be a Lok Sabha/Rajya Sabha member within 6 months of holding office of a minister/PM. Earlier on Wednesday, Mayawati had said that announced that she would not contest the Lok Sabha elections, citing "current political situation" for her decision. Congress president Rahul Gandhi Wednesday said that PM Modi's policies destroyed 1 crore jobs in 2018. Citing a report published in the Indian Express today, Gandhi said, "I thought India was producing 450 jobs a day. Turns out Modi’s policies destroyed 1 crore jobs in 2018. That’s 27,000 jobs lost every single day of 2018. India’s PM is a joke." 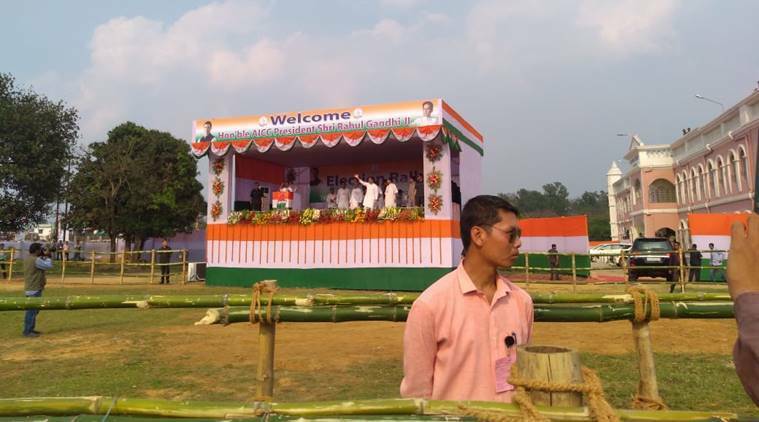 Congress president Rahul Gandhi arrived at a rally venue in Khumulwng, 25 km from Agartala. BSP leader Chandraprakash Mishra joins the BJP in the presence of Union Ministers JP Nadda and Smriti Irani in Delhi, ANI reported. The National Conference(NC) and the Congress agreed for an alliance in Jammu and Kashmir. NC Chief Farooq Abdullah said, " Jammu and Udhampur will be contested by Congress, I will contest from Srinagar." He also added that there will be a friendly contest between NC and Congress in Anantnag and Baramulla. Explaining that it will be a win-win situation for both Congress and NC, Ghulam Nabi Azad said, " Friendly contest means that there will be no cut-throat contest between us on these two seats (Anantnag and Baramulla)." The BJP will announce its seat sharing with BDJS in Kerala today, reports Express Reporter Liz Mathew. It is likely that Thushar Vellappally will contest from Thrissur. Former UP chief minister and Bahujan Samaj Party chief Mayawati on Wednesday announced that she would not contest the Lok Sabha elections, reported news agency ANI. The leader cited "current political situation" for her decision. Meanwhile, in Goa, Newly sworn in Chief Minister Pramod Sawant won the floor test in state assembly winning 20 votes while the Congress polled only 15.The BJP got 3 votes from the MGP, 3 votes from GF and 3 votes from Independent. 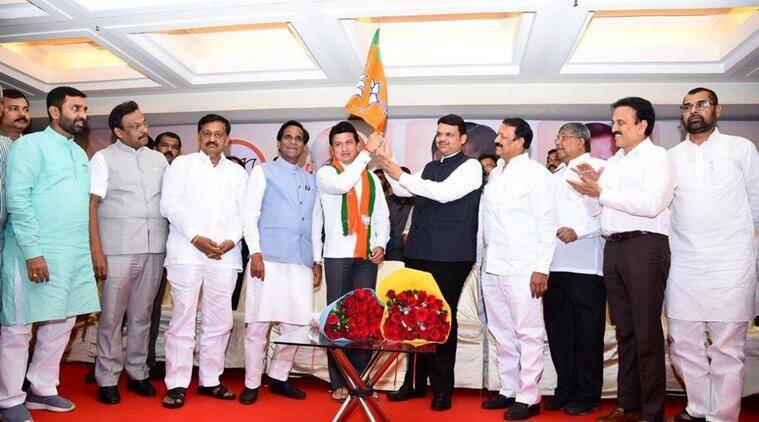 The MLAs who gave vote to BJP include Pandurang Mhadkaikar, three MLAs of Maharashtra Gomantak Party, three of Goa Forward, and three independent. "I am committed to make Northeast the centre for jobs, a manufacturing hub and I want to open the Indian Banking system to the people of Northeast so that it can help people to become entrepreneurs," Rahul Gandhi. "In 2018, the Narendra Modi government destroyed one crore job in India. It is so absurd that PM promises to give 2 crore jobs in India but the truth is everyday 30,000 jobs have been destroyed,"says Rahul Gandhi at a rally in Imphal. Congress President Rahul Gandhi addresses a rally in Imphal. "We know that PM Modi distributes money to the rich, we assure that each and every poor will be given money under the Minimum income support rule. It is our promise to implement minimum income support and each and every poor will be lifted above minimum income slab," says Rahul Gandhi. If Congress comes to power, special status to the Northeast will be reinstated. Addressing the crowd in Assi Ghat, Priyanka Gandhi asked the voters to raise their voice against a negative government: "You need a government that will understand you, I have only one request from you: Please raise your voice against a negative government -- anti-farmer, anti-woman and anti-labourer government." 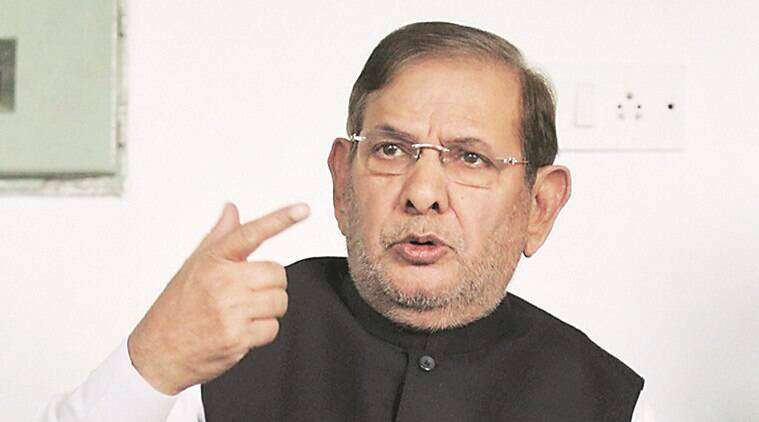 Loktantrik Janata Dal (LJD) leader Sharad Yadav said that " Mahagathbandhan will do a press conference in Patna on 22nd March to announce the seat sharing in Bihar." In Bihar, sources said the RJD will contest on 20 seats, with the remaining 20 seats to be contested by allies. The Congress gets nine seats, Upendra Kushwaha’s RSLP will get four seats, Jitan Ram Manjhi’s HAM(S) is to get three, and Mukesh Sahni’s Vikasheel Insaf Party and Sharad Yadav’s Loktantrik Janata Dal are to get two seats each. Reacting to Prime Minister Narendra Modi's attack on Congress, General Secretary Priyanka Gandhi Wednesday said, " PM has attacked every institution in this country for the last 5 years, including media." "We will continue our fight; the more we are harassed, the stronger will it get," she added. Launching a sharp attack on the Congress, Prime Minister Narendra Modi said, " the biggest casuality of dynastic politics are institutions"
PMO is now 'Publicity Minister's Office', Narendra Modi is indulging in mediocrity: Rahul Gandhi said to students in Manipur. After several party members quit and joined its partner National People’s Party (NPP) late on Tuesday, Thomas Sangma, National General Secretary of National People's Party (NPP) said, "I'm delighted to welcome 8 sitting Minister and MLAs to our party. National People's Party will not form an alliance with anyone. BJP's ideology is not right. It is not a secular party." We will ensure that Citizen amendment bill will never be a law because that is an encroachment on the culture and history of Northeast. 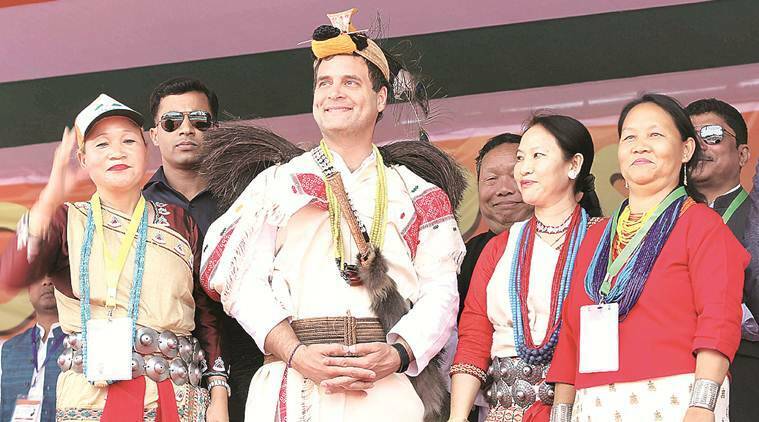 Urging the youngsters of Manipur, Rahul Gndhi said, "you can help us clean the political system"
When asked about Congress'vision for Northeast, Congress President Rahul Gandhi said, "beyond anything, the Congress will value the culture and language of the Manipuri people and states in Northeast. It will not impose anything on the way of living for northeast because nothing ui is more valuable than that." Secondly, he said, Congress will tackle the unemployment in the North East and it will increase significant spending on the same. Congress will also open the Indian Banking system for the Entrepreneurs of North East. BJP will contest on 14 seats in Kerala while its allies BDJS and Kerala Congress will contest on 5 and 1 seats respectively, PTI reported BJP National General Secretary Muralidhar Rao as saying. The National Conference (NC) and the Congress also finalised an alliance in Jammu and Kashmir. NC Chief Farooq Abdullah said, " Jammu and Udhampur will be contested by Congress, I will contest from Srinagar." He also added that there will be a friendly contest between NC and Congress in Anantnag and Baramulla. Addressing a rally in Imphal, Congress President Rahul Gandhi assured that "Citizenship amendment bill" will never be a law if Congress comes to power. He said, "Congress will never encroach upon the culture and history of the Northeast." Taking a dig on the Modi-led-BJP government, the Congress President, referring to the appointment of Vice-Chancellor in Madhya Pradesh's Makhan Lal University, said: "universities cannot run on the basis of an ideology, it should run on independent ideas." He also assured that the party will look into the "establishment of good quality educational institutions in Manipur." In Arunachal on Tuesday, Congress president Rahul Gandhi attacked the state BJP governments and the Centre over the way they handled last month’s protests in the state against the proposal to issue Permanent Resident Certificates (PRCs) to certain communities. Gandhi said that Congress would not allow any attack on the culture, language, and history of the people of the Northeast and claimed credit for blocking the Citizenship (Amendment) Bill —which has sparked protests across the Northeast — in the Rajya Sabha. In Varanasi, Congress general secretary Priyanka Gandhi Vadra urged the public to raise voice against "a negative government". "You need a government that will understand you, I have only one request from you: Please raise your voice against a negative government -- anti-farmer, anti-woman and anti-labourer government." Meanwhile, the Aam Admi Party on Tuesday made a fresh bid to forge an alliance with the Congress in Punjab, Haryana, and Delhi. AAP has demanded five seats in the national capital.